When it comes to choosing a sweet treat I will always pick cheesecake. ALWAYS. Hands down, it is my favorite dessert of all time. So when I began eating low carb / low sugar I knew I had to find a way to still curb this craving. Another popular dessert around my house is pumpkin pie. I have never been a huge fan, but my husband and daughter both are. So, what’s a cheesecake lovin girl to do? Well make an epic low carb pumpkin cheesecake of course!! Fall is beginning to linger in the air of Oregon, which absolutely just fills my soul. Making this my FAVORITE time of year. Once that glint of crisp air hits and the leaves start to change, I want all things baking to fill my house with the yummy smells of spice. 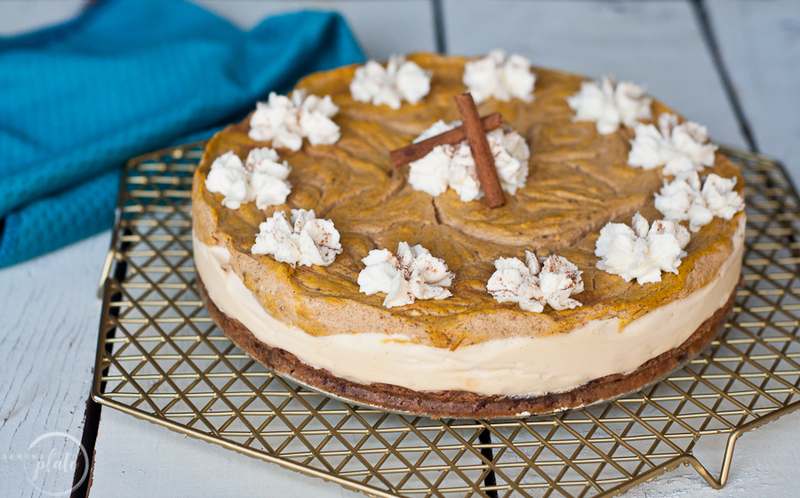 Enter this yummy low carb pumpkin cheesecake recipe! 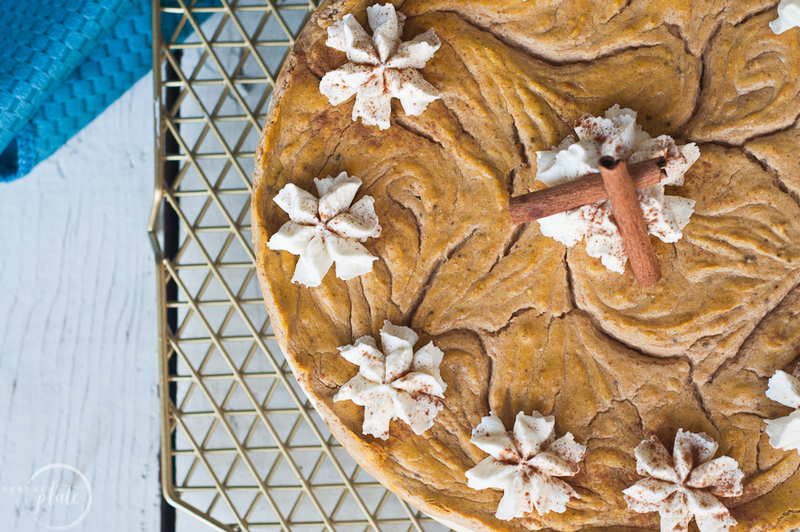 From the crust to the filling, this low carb pumpkin cheesecake is sure to have you in disbelief that it is low sugar and low carb! 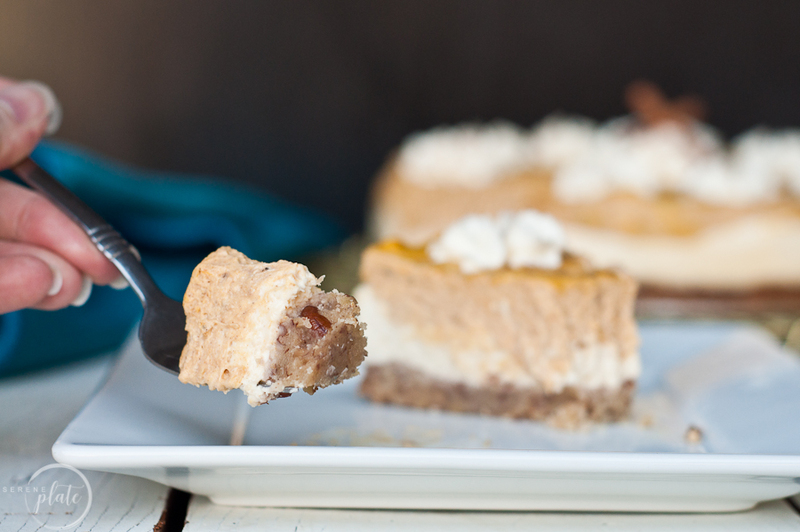 Be warned though… while some think making a cheesecake is super intimidating, this low carb pumpkin cheesecake recipe is sooooooooooo easy to make!! Promise! I would love a comment from you! Tell me how much you LOVE cheesecake and what YOUR favorite kind is!! Mix all ingredients well, it will be sort of crumbly. Spray your springform pan or line it with parchment paper and press crust in pan. I used a 10 inch springform pan. While the crust is baking, make the cheesecake filling. Beat cream cheese and 3/4 cup of sweetener together thoroughly. Add in the vanilla extract, mix until combined. Take out 2 to 2.5 cups of the cheesecake filling and set aside. To the remaining cheesecake filling, add the cinnamon, ginger, nutmeg, ground cloves, and pumpkin puree. On a low speed, mix until just combined. Don't over mix the filling here. If you mix in to much air at this stage, the cheesecake may fall. Poor the plain filling into the cooled crust. Scoop the pumpkin cheesecake mixture on top. Swirl the two mixes together lightly. Place the cheesecake in the oven on the middle rack. Place a pan (with a lip) on the rack directly under the cheesecake. Fill it with water. This will help your cheesecake remain crack free on top. Bake for 50 minutes or until edges being looking dry and center jiggles slightly. Cool on the counter for a while. Refrigerate for at least 6-9 hours before serving.